While bubble chambers were extensively used in the past, they have now mostly been supplanted by wire chambers and spark chambers. Notable bubble chambers include the Big European Bubble Chamber (BEBC) and Gargamelle. Bubbles grow in size as the chamber expands, until they are large enough to be seen or photographed. Several cameras are mounted around it, allowing a three-dimensional image of an event to be captured. Bubble chambers with resolutions down to a few micrometers (μm) have been operated. Notable discoveries made by bubble chamber include the discovery of weak neutral currents at Gargamelle in 1973, which established the soundness of the electroweak theory and led to the discovery of the W and Z bosons in 1983 (at the UA1 and UA2 experiments). 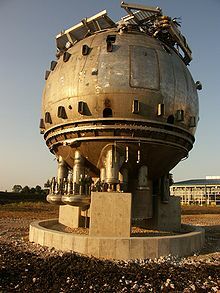 Recently, bubble chambers have been used in research on Weakly interacting massive particles (WIMP)s, at SIMPLE, COUPP, PICASSO and more recently, PICO. 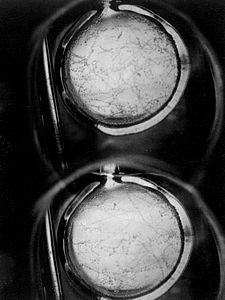 Gargamelle, a heavy liquid bubble chamber which operated in CERN between 1970 and 1979. ^ Donald A. Glaser (1952). "Some Effects of Ionizing Radiation on the Formation of Bubbles in Liquids". Physical Review. 87 (4): 665. Bibcode:1952PhRv...87..665G. doi:10.1103/PhysRev.87.665. ^ "The Nobel Prize in Physics 1960". The Nobel Foundation. Retrieved 2009-10-03. ^ Anne Pinckard (21 July 2006). "Front Seat to History: Summer Lecture Series Kicks Off – Invention and History of the Bubble Chamber". Berkeley Lab View Archive. Lawrence Berkeley National Laboratory. Retrieved 2009-10-03. ^ "1973: Neutral currents are revealed". CERN. Retrieved 2009-10-03. ^ "COUPP experiment – E961". COUPP. Retrieved 2009-10-03. ^ "The PICASSO experiment". PICASSO. Retrieved 2009-10-03. ^ "The PICO experiment". PICO. Retrieved 2016-02-22.